Lok Sabha Elections 2019: Rs 72,000 for 5 crore families would mean Rs 3,60,000 crore, which is about 13 per cent of Rs 27,84,200 crore budgeted expenditure for 2019-20. 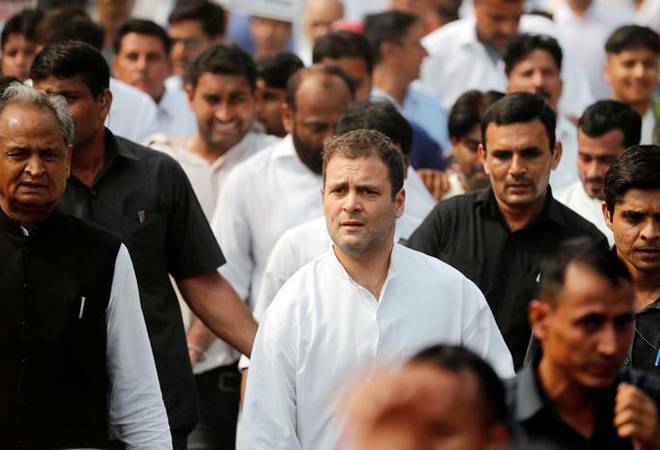 Congress chief Rahul Gandhi has upped the direct benefit transfer (DBT) game to a new level by promising that if voted to power, his party will ensure 20 per cent of India's poor- about 25 crore citizens or 5 crore families-a minimum income guarantee of Rs 72,000 a year. Learning the trick of smart acronyms from Prime Minister Narendra Modi, Congress intends to call their scheme NYAY (Nyuntam Aay Yojana or basic income scheme). Rs 72,000 for 5 crore families would mean Rs 3,60,000 crore, which is about 13 per cent of Rs 27,84,200 crore budgeted expenditure for 2019-20 and slightly more than the entire money Narendra Modi has set aside for centrally sponsored schemes in 2019-20. In other words, the budgetary allocation of Rs 3,27,679.43 crore for centrally sponsored programmes covered the central government's 29 schemes including the MNRGA, Swatch Bharat Mission, National Health Mission and National Education Mission. It will be about 2 per cent of GDP, which means that either India will have to go back on its fiscal discipline path or find resources by curtailing other welfare measures. Congress party claims to have already looked into the fiscal implications. We will have to wait for the party's manifesto to see if it gives more clues. That's how some leaders of the ruling party BJP responded to the poll promise made by Rahul Gandhi. But it is far from true. In fact, central governments increase their budgetary allocations by this size in several key components of expenditure. For instance, the total expenditure proposed for 2019-20-Rs 27,84,200 crore-itself was an increase of Rs 3,26,965 crore (13.3 per cent) over the revised estimates of 2018-19. Once the full benefits of GST reforms kick in, revenue buoyancy can more than take care of such increase, provided the government will go slow on increase in expenditure elsewhere. It may tweak some schemes, reduce allocations for some other, but the promise is certainly not something which is impossible to fulfil. While Congress needs to worry about the implementation of the scheme only if it's elected to power, it needs to be wary about BJP adopting a somewhat similar promise in its poll manifesto too. The promise to provide direct income support to small and medium scale farmers, even if it is Rs 6000 per household per year, is a beginning in this direction.